This .22 WMR ammunition is optimized for self-defense use in compact short-barreled (2 inches or less) pistols. It is designed to expand reliably even at the relatively low velocities (about 1,050 feet per second) produced in such firearms. 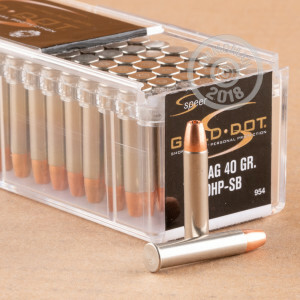 Gold Dot ammunition features caliber-optimized bonded-core bullets with no risk of core-jacket separation. The series' centerfire versions are widely issued by police departments. This ammunition is loaded in Lewiston, Idaho using primers from Speer's sister company, CCI. CCI is best known for the reliability of its primers and rimfire ammo, a crucial trait in a self-defense load. 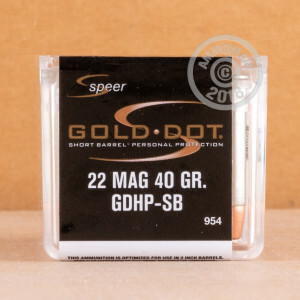 Put this ammo through its paces with a few boxes or pick up some practice rounds at AmmoMan.com. All orders over $99 ship for free!